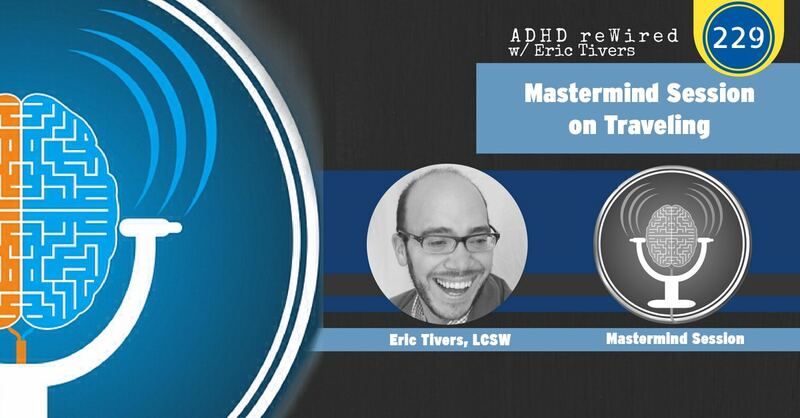 Over the next few weeks, you’re going to hear a few very special episodes that are a part of a series of mastermind sessions that I did with a few members of the coaching group alum. On this episode, Erika is on the hot seat over travel challenges. She explains the aspects of traveling that give her the most trouble. Then, other members of the mastermind ask questions and share ideas and advice to help Erika overcome these situations. [07:53] – Marisol starts things off by giving us a little update on our last mastermind conversation, which was in Episode 220. [12:03] – Erika lays the groundwork for this discussion on traveling. [15:48] – I share that over the years, I have become less interested in leaving the house. I like being places, but I don’t like going places. [18:19] – Will asks for clarification on the source of Erika’s anxiety in these situations. [19:46] – Marisol asks how long these vacations or trips are. [21:53] – Natalie is a professional organizer with a lot of experience in this area. She says she understands Marisol’s need to have things clean before she leaves, and provides a few tips. [27:09] – I speculate that Marisol is experiencing executive functioning anxiety, and share some other examples of this. [29:41] – Tina asks if routine would help alleviate pressure and anxiety. [31:50] – Will shares something he recently read in a Brene Brown book that is related to this conversation. [33:08] – I ask Marisol to consider the one thing she would like to accomplish on a short trip. [34:42] – Marisol points out the time restrictions on these shorter vacations. [38:22] – We discuss the issues around clothing and body issues and traveling. [44:27] – Will says that he doesn’t have as much time as he thinks he does during the day. He has a trip coming up, and he talks about making a list of things to do when he returns. [47:05] – We talk about the idea that this anxiety is caused by a disturbance in routine. This leads to a discussion about negative talk and staying positive in this situation. [52:53] – Natalie revisits the discussion on clothing size and options. [59:37] – I talk about the five-second rule, which sometimes works for me. [1:01:54] – Natalie offers help as her accountability partner. [1:02:27] – Erika shares her action steps, moving forward. This episode is my first ARC and I have found my tribe. Nothing brings home the accuracy of a diagnosis like listening to a group of people talk about experiences and struggles that seem to have been gleaned right from my life. Not that I have the 100% patience for canonical GTD but I think a brain dump weekly and scheduling the things she needs to do and getting some of the things done would bring a lot of peace to Erika. I get that feeling too and what I find really helps is just getting everything out of your head and onto paper or into a system. The anxiety she feels is probably the processing power drain you get from having your mind thinking about the silverware drawer when you have no plans to clean it out anytime soon. You’re still wasting cycles on it even though it’s not actionable right now.